It is ceremonial for tech gurus to make predictions about technology and the trends at the beginning of the year. With Big Data already being seen as the next trillion dollar technology, multitudes of predictions were made by the specialists and influencers for the year 2016. As we near the end of first quarter of 2016, it is the right time to revisit some of these predictions. While some of these predictions are hardly visible anywhere, others seem to be gaining steam and would change the way different businesses make use of this technology. 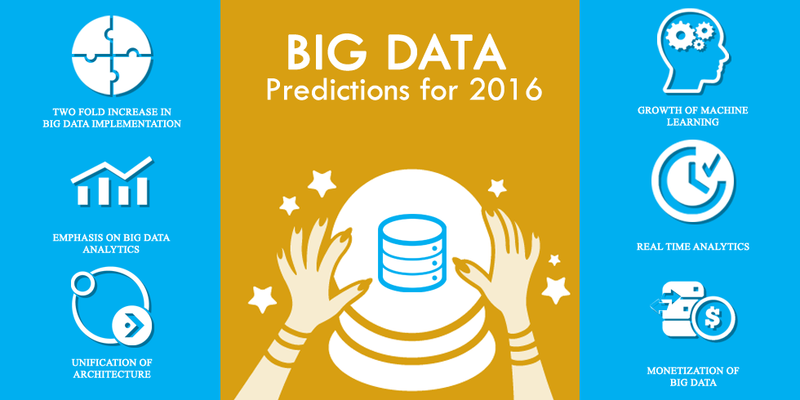 So here are the big data predictions for 2016 that are expected to bring about a major change in the world of business. In 2014 a mere 10% of the top businesses in the world implemented big data solutions. This figure jumped to 30% in 2015 and this year we expect a two-fold increase in big data implementation across different industries. Small & medium enterprises are also following the cue from their giant competitors and drawing mileage out of big data. While big data has been around for some time, 2016 will mark a shift in the way this data helps businesses offer better products and services to their client. Businesses are increasingly becoming aware of the importance of big data analytics and are continually investing in it. Trends suggest that investment in Big Data Analytics would grow three times as fast as the investment for on-premises analytics. 2016 has signaled the unification of data architecture as different data platforms would unite and become the foundation of data gathering and analytics strategy. This would also lead to phenomenal growth in predictive analytics and implementation of apps across various verticals in business. Big data analytics & management sounds expensive and labor intensive. This is why most businesses implementing Big Data solutions prefer to opt for ML or Machine Learning. This will help reduce the time & effort spent in analyzing large volumes of data and unearthing the trends and opportunities in the market. Machine Learning is also benefitting big data users in terms of real-time analytics. Many organizations are using near real-time data in decision making. This is allowing them to study the needs and aspirations of the customers, demands in the market and draw maximum benefits out of this knowledge.